Built on the orders of the Dutch consul Daniel Gildemeester, the Seteais Palace was built between 1783 and 1787 on lands granted by the Marquis of Pombal. The consul chose to build his house on the border of an elevation, from which the vast landscape around the Sintra hills could be admired. The palace was surrounded with a large garden with fruit trees. In 1797, some years after the consul's death, his widow sold the palace to Diogo José Vito de Menezes Noronha Coutinho, 5th Marquis of Marialva. The palace was enlarged between 1801 and 1802, probably by neoclassical architect José da Costa e Silva, author of the São Carlos Theatre in Lisbon. The palace was turned into a symmetrical U-shaped building, with the consul's house becoming one of its wings. The cornice of the buildings that compose the main façade was decorated with typical neoclassical motifs like vases, busts, and reliefs of garlands. The gardens of the palace were remodeled following romantic trends. The old and the new wings were connected in 1802 by a neoclassical arch, built in honor of Prince regent John VI and Princess Carlota Joaquina, who visited the palace in that year. The monumental arch, decorated with the bronze effigies of the royal couple and a commemorative Latin inscription, is attributed to architect Francisco Leal Garcia. The walls of several inner rooms of the palace were decorated with frescos attributed to French painter Jean Pillement and his followers. Painted motifs include exotic vegetation and mythological characters, typical of the neoclassical taste. The palace belonged to Joao Fernando Salazar e Bragança from 1890 - 1910. After changing hands several times, the palace was acquired by the Portuguese government in 1946. The Seteais Palace has been used as a luxury hotel since 1954, but its original characteristics have been preserved. 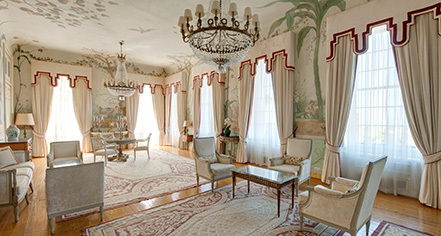 Fully restored in partnership with Fundação Ricardo Espírito Santo Silva in 2009, the guestrooms and ballrooms feature murals, frescoes, tapestries, and furniture restored by skilled local artisans. The Tivoli Palácio de Seteais has welcomed numerous famous guests over the years, including Agatha Christie, Art Garfunkel, Brad Pitt, Catherine Deneuve, David Bowie, John Malkovich, Johnny Depp, Marguerite Yourcenar, Mel Gibson, Mick Jagger, Paul Simon, Richard Nixon, and Roman Polanski. 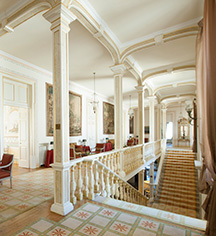 Tivoli Palacio de Seteais, a member of Historic Hotels Worldwide since 2016, dates back to 1787.